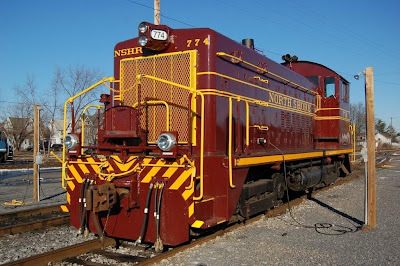 The Somerset County 4-H Trainmasters will be hosting their annual Winter Train Show on January 31 & Febuary 1, 2009 at the Somerset County 4-H Center. 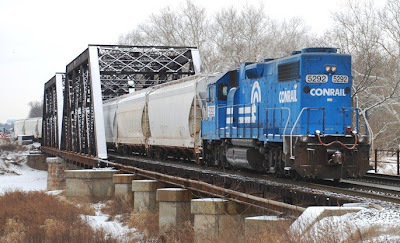 There is an interesting report available on the web that is "A Weekly Report of North American Rail Freight Traffic by Major Railroad and Commodity." It is currently showing data for week 03 of 2009. Is traffic showing signs of rebounding after a steep decline in December? NORFOLK, VA. – Michael J. Wheeler has been named vice president transportation for Norfolk Southern Corporation, effective Feb. 1, with headquarters in Norfolk. He will report to Mark D. Manion, executive vice president operations. Wheeler joined Norfolk Southern in 1985 as a research engineer. He served in positions of increasing responsibility in operations before being named general manager mechanical field operations in 2006 and general manager transportation in 2007. Wheeler holds an undergraduate degree from the University of Tennessee and an MBA from Virginia Tech. 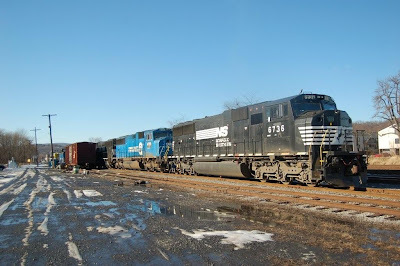 NORFOLK, VA. – Norfolk Southern Corporation (NYSE: NSC) announced that its Board of Directors today voted to increase the regular quarterly dividend on the company’s common stock by 6 percent, or 2 cents per share, from 32 to 34 cents per share. The increased dividend is payable on March 10, to stockholders of record on Feb. 6. Today’s dividend increase is in addition to a 10 percent increase announced in July 2008. 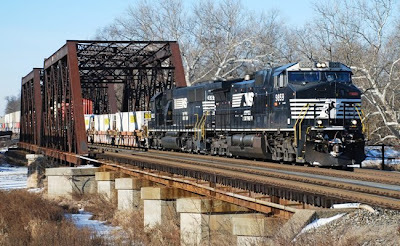 In total, Norfolk Southern has increased its dividend 17 percent over the last 12 months. 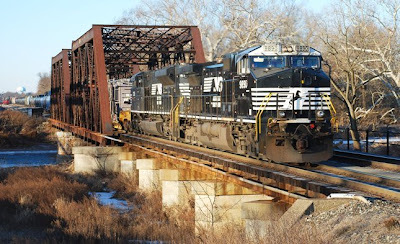 Since its inception in 1982, Norfolk Southern has paid dividends on its common stock for 106 consecutive quarters. CSX Q703 (Oak Point, NY to Collier, VA) @ 9:23- would have CSX 5283 and CSX 5002 taking out the garbage for disposal. CSX MA2- would depart Manville with four cars (one platform car / three ACF cars) at 10:15 and return with twelve cars (the platform car / eleven ACF cars). Motive power was PRR 5292. CSX Q190 (Philadelphia, PA to South Kearny, NJ) @ 11:15- had CSX 930 as its leader coupled up with CSX 4821. CSX Q300 (Philadelphia to Oak Island) @ 11:55- would have no work at Manville on this Sunday morning. 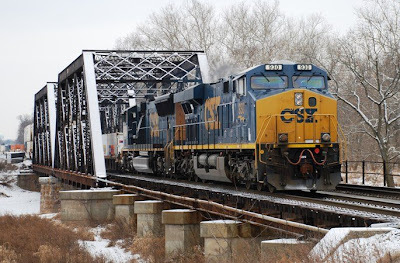 Motive power was CSX 8838 and CSX 7700 with a long train of mixed freight. 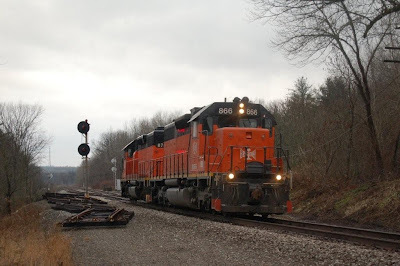 NS 20G (Los Angeles, CA to Kearney, NJ) @ 8:12- was eastbound with NS 9354, BNSF 5225 and BNSF 5097 for motive power. The train consisted of COFCs. 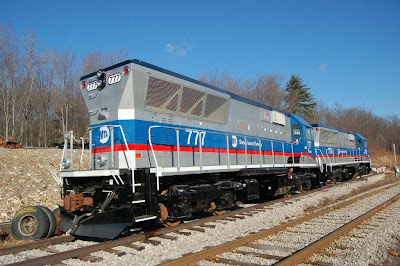 NS 21M (North Bergen, NJ to Chicago, IL) @ 8:37- would have NS 2611 and NS 9536 for its power. NS 20K (Chicago, IL to North Bergen, NJ) @ 9:20- was also eastbound with NS 9208 as its leader, followed by NS 8974 and NS 93?? with a short train of TOFCs. 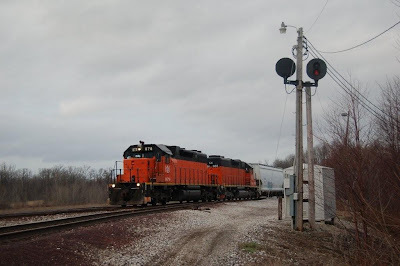 NS 20R (Chicago, IL to Kearney, NJ) @ 9:30- had NS 9859 and NS 6623 bringing this intermodal train of COFCs east. In addition to those four trains, CSX's Q300 was heard from but not seen over my scanner as I was calling it a morning. 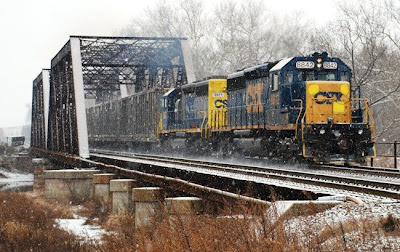 Five great photos of winter railroading on The Bessemer Route by Dave Trenn. I'll bet at least one will take your breath away! 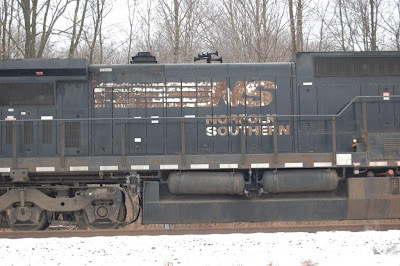 NORFOLK – Norfolk Southern Corp. (NYSE: NSC) will hold its fourth-quarter 2008 analyst meeting at 9 a.m. EST on Wednesday, Jan. 28, 2009, at JPMorgan Chase & Co., 270 Park Ave., New York, 11th floor. Norfolk Southern expects to issue its earnings results Tuesday, Jan. 27, 2009, after the close of trading on the New York Stock Exchange. 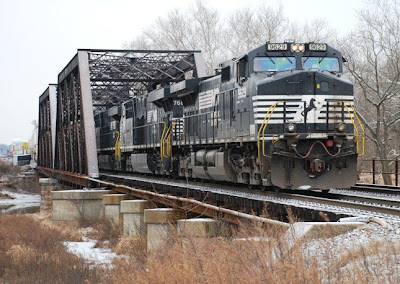 In addition to detailing recent financial results, the meeting will provide Norfolk Southern with an opportunity to present an overview of 2009 capital expenditure plans, business growth opportunities, service delivery enhancements, and development initiatives. Those interested in participating via teleconference can dial 877-869-3847 (domestic) or 201-689-8261 (international) several minutes prior to the call. An audio replay will be available until Feb. 4 following the live broadcast by dialing 877-660-6853 (domestic) or 201-612-7415 (international) and using PIN 305567 for either number. In conjunction with the call, a live Internet Webcast will be accessible, and presentation materials will be posted on the company’s Web site at www.nscorp.com under the Investors section. Following the earnings call, an Internet replay of the presentation will be archived on Norfolk Southern’s Web site. In addition, the replay will be available for download to a portable audio player or computer as an MP3 – or podcast – file. Both the replay and MP3 file can be found at www.nscorp.com in the Investors section. 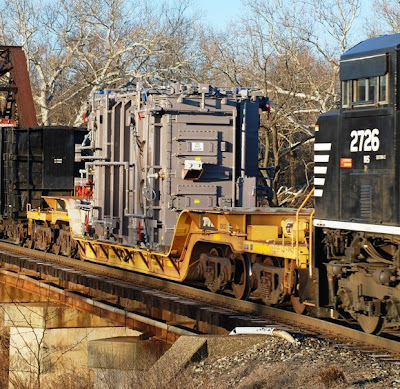 For electronic notification of earnings events, subscribe to NSInvest, Norfolk Southern’s e-mail distribution list for news releases on earnings and issues pertaining to the financial performance of the company. To subscribe, follow directions on the NS Web site under the Investors tab. 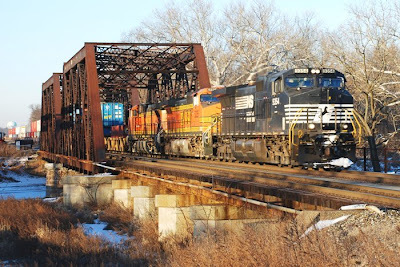 There is an interesting report available on the web that is "A Weekly Report of North American Rail Freight Traffic by Major Railroad and Commodity." It is currently showing data for week 01 of 2009. The Most Negative* Week in Railshare History!!! * Highest number of negative year-over-year changes. NS 21M @ 8:25- NS 2778, NS 2755 and NS 2764 had thirty-six cars, estimated train length 8,300 feet. NS 20R @ 9:32- NS 9629, NS 7680, NS 7576, NS 8842 and NS 2578 would bring this short intermodal east after a crew change in Manville. 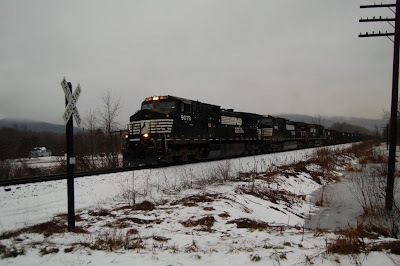 NS 212 @ 9:45- had NS 8908, NS 9470 and PRR 8460 (ex-LMS 720) kicking up the snow as it passed by my location. CSX Q300 @ 10:35- After taking care of an air hose problem that was discovered around 10:00, Q300 finally departed Manville with CSX 8842 and CSX 8871 in charge of thirty-five loads and thirty-six empties. CSX Q417 @ 10:43- with the Trenton Line now clear, Q417, with CSX 7809 and CSX 8051, proceeded south with fifty-five cars of mixed freight. NS 64J @ 10:50- this unit train of empty garbage containers headed east with NS 2510 and NS 8398 in charge. The following article concerning the Port Reading Junction in Manville, NJ is from the Courier News for Tuesday, 1-6-09. 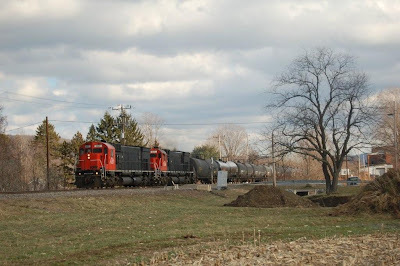 A railroad-restoration project now under way by Consolidated Rail Corp. aims to reduce noise, rail-traffic congestion and odors near a bustling railroad junction. The multimillion dollar project — which was unveiled to borough officials last month in a presentation given by Tim Tierney, vice president and chief engineer with Conrail and David Leymeister, project manager with Woodbridge-based Jacobs Engineering — plans to restore a section of tracks known as the Port Reading Junction Interlocking tracks. 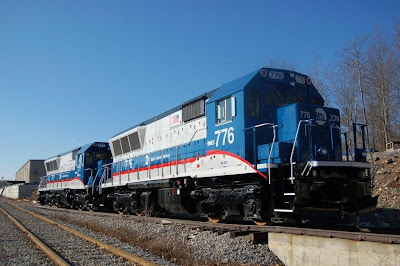 The presentation was required by the Federal Highway Administration before Conrail could move forward with its plans. It did not require approval of the Borough Council. The project is being funded jointly through Conrail and federal highway-safety grants distributed by the state Department of Transportation, Tierney said in a telephone interview Monday, Jan. 5. Work already has begun on the project and is expected to be completed this spring, he said. The Port Reading Junction previously had served the Reading Railroad Trenton and Lehigh Valley Railroad Main Lines. 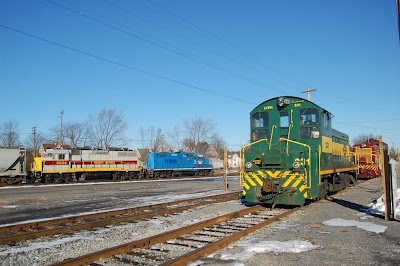 It now is a major railroad junction used by Conrail, CSX and Norfolk Southern for freight operations into northeastern New Jersey from points south and west. It also is the terminus where CSX trains come from Philadelphia, and Norfolk Southern trains come from the west. Currently, Tierney said, only one train can travel at a time on the tracks, while the other train has to wait. The goal of the project is designed to eliminate wait time and lead to more efficient rail flow by eliminating a point of congestion where multiple tracks merge onto a single track, he said. 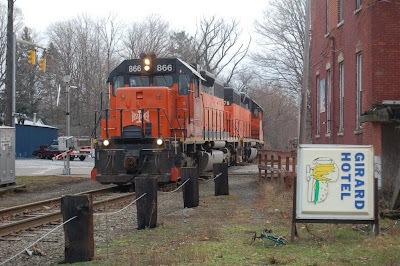 In the past, trains would stop on the tracks — some carrying loads of garbage to a nearby dump would release odors into the air and disturbed residents, Borough Administrator Gary Garwacke said Monday. "The project is designed to speed traffic along," Garwacke said. "Since the rail lines are always backed up, this will help alleviate the problem." Tierney said residents will not be affected by construction or increased sound levels during the project because work will take place only on existing property owned by Conrail. The project will include a relocation and reconfiguration of an existing track and will involve some minor cuts to an existing road next to the mainline track. The existing track also will require maintenance work such as tie renewal and surfacing for the new crossovers and replacement of existing crossovers, said Anthony J. Scolaro, principal planner with Jacobs Engineering, in a November letter to the borough. According to the letter, there are no road crossings on the tracks and the closest residences are along Manville Avenue, East Camplain Road and Valerie Drive — about 100 feet from the project area. Received the following via email from Kermit Geary, Jr. Text, photos, and captions are his. 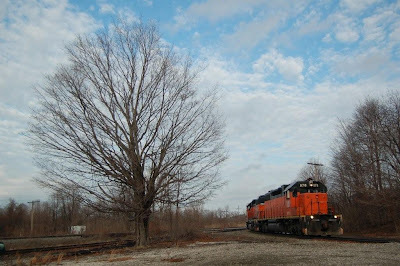 This is Part 5 of 5 from a rail fan trip Kermit made to western PA and NY in December. 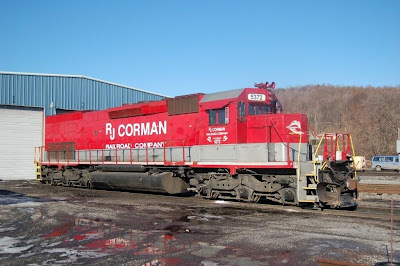 Finished off the trip by visiting the RJ Corman operation in Clearfield, PA...found a couple of units sitting out, the rest were heading to Keating to pick up a 231 car empty train for loading. Not knowing exactly where they were and not the best of chase roads, we opted to push on through to Loch Haven (Nitney & Bald Eagle)(a North Shore switcher and a caboose were found) and into Williamsport (Newberry Jct) where we found most of the Lycoming Valley's roster as well as a few other surprises. Then Home and relaxation before the New Years parties!! Happy New Year and may 2009 bring plenty of trains, sunshine, and visits with good friends! Received the following via email from Kermit Geary, Jr. Text, photos, and captions are his. 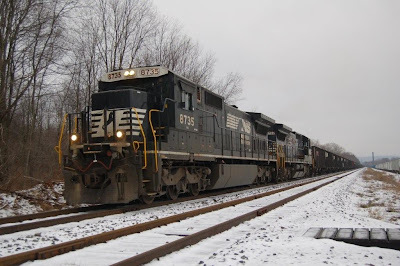 This is Part 4 of 5 from a rail fan trip Kermit made to western PA and NY in December. First stop on the way home was at the Brookville Mining Equipment Co's headquarters in Brookville, PA. After stopping at the office to request permission, we were welcomed to tour the property and photograph anything we wanted. Fresh outside were the four unit order by MTA- Staten Island, NY's BL20G units. Also found a 9-ton mine motor going through a mechanical shakedown prior to its acceptance by Eastern Coal Associates, WV. These BL20G's are unique units. Powered by MTU-Detroit diesel on newly manufactured frames (only the trucks have been recycled from an existing application) develop 2000hp that meets or exceeds Tier 3 standards. Received the following via email from Kermit Geary, Jr. Text, photos, and captions are his. 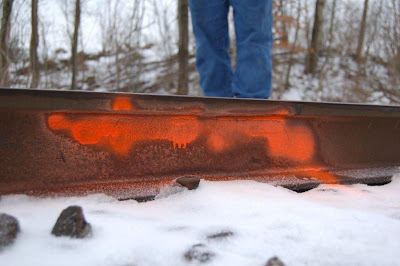 This is Part 3 of 5 from a rail fan trip Kermit made to western PA and NY in December. Sunday was supposed to be devoted to the WNYP...There WAS to be a job switching in the Meadville area, as well as the HNME arriving from Hornell, NY, with a probable run to Franklin, PA. 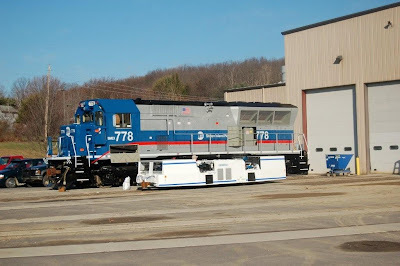 HOWEVER, due to a lack of crews (vacations, etc) The HNME didn't leave Olean, NY until after noon on Sunday and the ME Switch crew was cancelled! Heading east as rapidly as allowed by the back roads to the Salamanca, NY area, we caught the HNME with two six-axles heading west through Steamburg, NY. The chase was on. 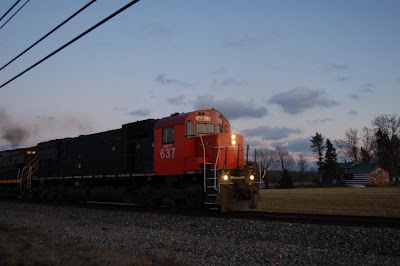 After a stop in Falconer to swap the 636 for the 430, they slowly continued west, meeting the sunset in Corry, PA.
Oh well, didn't get as much as we were hoping for, but this is real railroading....everything is subject to change!! A quick drive to Greenville to drop off Jonathan, then headed East to visit a few Shortlines on Monday. Greetings all: Hope you have had a very Merry Christmas and are looking forward to a more prosperous New Year!!! 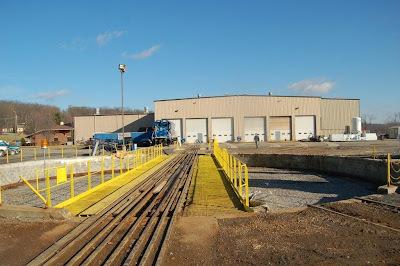 Spent some time in Western PA visiting with some good friends and visiting some of the neater rail operations out there. 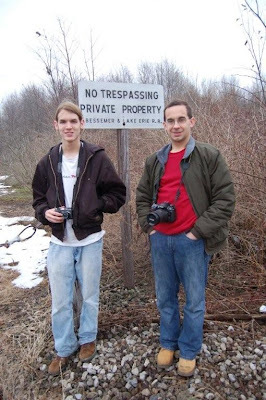 Met with my long-time travel companion, James Rowland in Egypt, PA and drove west through lightning and heavy rains to the Greenville, PA area where we met with Nate Clark and his son Jonathan. After a short visit, we determined that the Bessemer was going to be sending two SD-38's north. Jon opted to go with us and the chase was on! 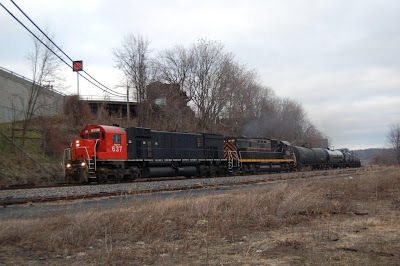 Upon arrival at Albion, PA we found that they were going up the Erie Branch to Girard, PA....something that happens only once or twice a month!! 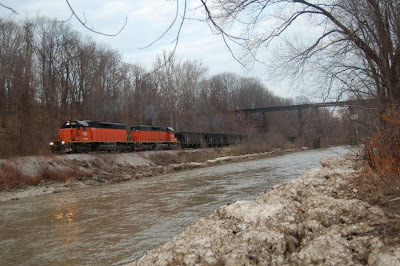 After chasing the train on the Erie Branch, they then headed for Conneaut Harbor and picked up 20 cars of stone. 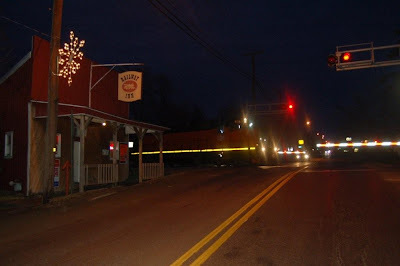 And as dusk settled down on this sweet operation, the train eased south through Albion, PA allowing for one last image before we left the chase. After a good meal and an image show at the hotel with other friends in the Meadville, PA area, it was time to prepare for part 3. The New York Society of Model Engineers (NYSME) will be hosting a Slide Show covering the "The Erie side of the EL concentrating on operations in NJ including coverage to Port Jervis". Fell free to forward this invitation to your friends. NS 18G @ 8:25- had an estimated 114 cars of mixed freight would take the controlled siding and wait for NS 21M to pass. 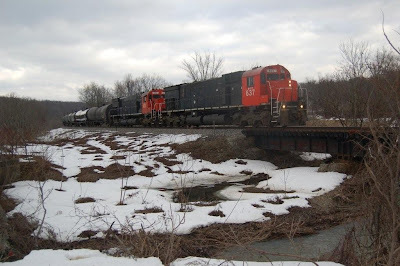 Right behind 18G's power of NS 9890 and NS 2726 was a "high and wide" load. Couldn't tell what it was, perhaps some type of transformer? NS 21M @ 8:33- would have NS 9853, NS 9323, NS 8823 and NS 2633 as its power for this lengthy intermodal train. CSX Q300 @ 9:05- would finish working Manville yard and depart with thirty-three cars. 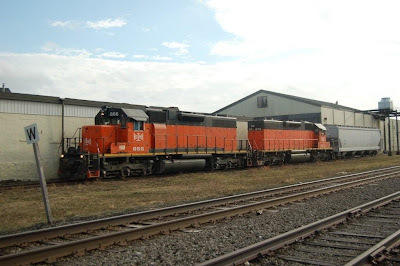 Motive power consisted of CSX 5010 and CSX 501. 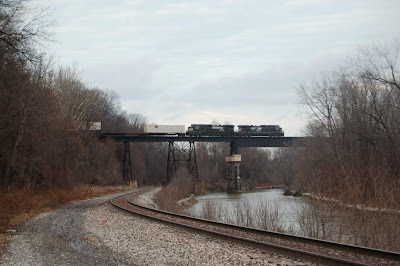 NS 65J @ 10:00- had NS 3445 as its leader with NS 9543 taking the trash west on this 3,400 foot long train. with the coffee running low, it was time for me to go and warm up with a fresh cup! Received the following via email from Nathan S. Clark, Jr. The text and 2004 photo are his. This is B&LE engineer Ray Camp's annual 'gig'. 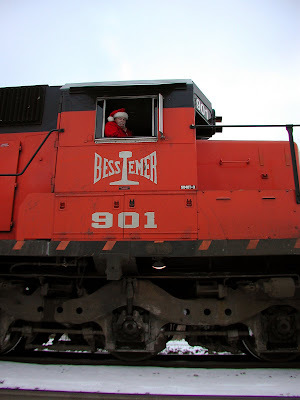 He dons the Jolly Ol' Elf's garb, puts a string of twinkling, battery-powered 'marching/chase' lights around the outside of his cab window at night, and opens the throttle! Not exactly a particular 'Santa Train'; just whatever run he gets called for. Still, Ray brings holiday cheer and smiles (and double-takes!) all along the main line of The Bessemer Route! A really nice 'touch', for a workaday guy who is performing the utilitarian task of getting Minnesota's Mesabi ore to the Edgar Thomson Works furnaces in Pittsburgh from the boats at the Conneaut docks on Lake Erie. Recieved the following via email from Kermit Geary, Jr. The text, photos, and captions are his. Kermit works for Sperry Rail Services (SRS). Note: click on the photo to see it enlarged. Then use your "back" button to return here.